Saturday, October 17, 2015 Doors open at 5 p.m.
LAS VEGAS – September 10, 2015 – The nation’s premier amateur mixed martial arts (MMA) organization, Tuff-N-Uff today announced it is teaming up with Randy Couture for its sixth annual Round 6: Operation Knockout event Saturday, October 17, 2015. Now in its sixth year, “Round 6: Operation Knockout” is an annual Mixed Martial Arts (MMA) event that was created to help raise funds and awareness for wounded soldiers and their families. This year’s event will be held at Brooklyn Bowl. Doors open at 5 p.m. and tickets are available starting at just $25 through www.tuffnuff.com or online http://www.brooklynbowl.com or by visiting the Brooklyn Bowl box office. Following five successful years, Operation Knockout continues to grow in size and finds a new home at the Brooklyn Bowl. This exciting, unique charity event features a night of amazing fights and a fabulous silent auction. There will be something for everyone with eight amateur MMA bouts. Xtreme Couture G.I. Foundation provides necessary support and services for wounded soldiers and their families, many of whom return with traumatic amputations, gunshot wounds, burns and blast injuries. Operation Knockout continues to build on its efforts to raise more money and help more wounded soldiers and their families. The event has raised over $133,000 since its first year and with help of their generous sponsors and donations, the event returns this October 17th at Brooklyn Bowl for its biggest year to date. 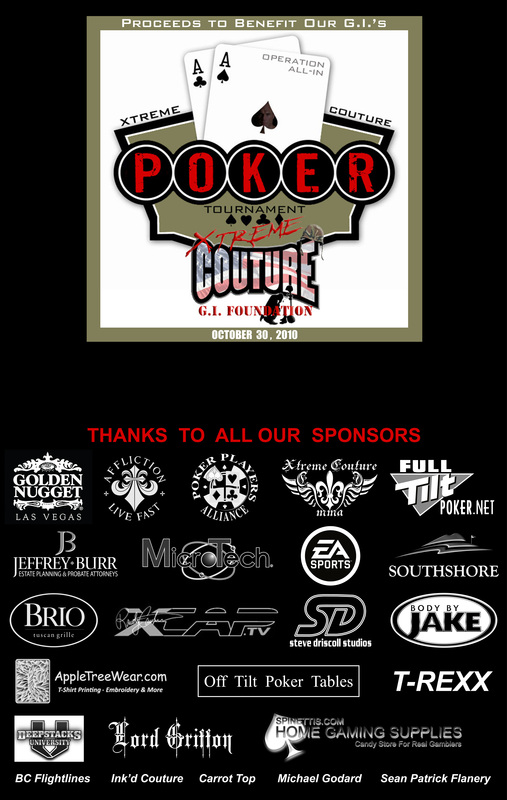 For more information about this great event, contact Xtreme Couture G.I. Foundation at 702-616-1022 or please visit www.xcgif.org. The Xtreme Couture GI Foundation, a 501 (c) 3 non-profit corporation, was founded by Randy Couture in 2009 to honor the veterans of America’s armed forces. The foundation was especially formed to raise money and awareness for those wounded in action and their families. For more information on the foundation please visit: http://www.xcgif.org. ABOUT RANDY COUTURE: Randy Couture served in the Army for 6 years within the 101st Airborne, is a former 6x World MMA Champion, TV and Actor Movie star who was in the Sylvester Stallone movie series – The Expendables I, II and III. For more information, visit TuffNUff.com and Follow on Twitter and Instagram @TuffNuff and LIKE us on Facebook.com/TuffNUff. During Operation Knockout’s first year in 2010, the event drew close to 300 people at Randy Couture’s Xtreme Couture Gym that featured a 10-fight exhibition with up-and-coming fighters. Additional entertainment and auction items donated from sponsors, including gym owner and MMA legend Randy Couture, helped to raise $12,000 for the charity. The event proved that MMA supporters were not only very interested in seeing excellent fights, but also in supporting those in need in their community. Continuing to grow, year two brought a partnership with Tuff-N-Uff showcasing 10 fights sanctioned by the Nevada State Athletic Commissioner, adding a new layer of legitimacy for the event. The event was also televised for the first time. Due to these efforts and great people volunteering their time and services, the event raised more than $17,000 with close to 700 people in attendance. In year three, the event brought on a new partner and a new venue with The Pearl Theatre and The Palms Hotel & Casino. The third annual event raised even more money with $34,000 and more than 750 people in attendance. The fourth annual event was at the Texas Station in which it raised $42,000 and more than 850 people in attendance. Brooklyn Bowl Las Vegas is where locals and tourists go for a nightly eclectic blend of live music, 32 bowling lanes and five bars with an all-house made menu created and executed by brothers’ Bruce and Eric Bromberg’s Blue Ribbon Restaurants. When there is a live show, there can be more than 2,000 concertgoers enjoying live music programming from the general admission area, as well as the multimedia bowlers’ lounges adjacent to the lanes, or the private lounge boxes overlooking it all. Since opening in March 2014, notable performances include Elvis Costello & The Roots, Jane’s Addiction, Phil Lesh & Friends, O.A.R., Smashing Pumpkins Robert Plant, and Jack White. Brooklyn Bowl is also located in Brooklyn and London, making Las Vegas its third location. Rolling Stone calls Brooklyn Bowl “one of the most incredible places on Earth” while USA Today says “Music lovers and food lovers finally have a spot to share the night: Brooklyn Bowl at The LINQ.” For additional information, including the most up- to-date show lineup, visit www.BrooklynBowl.com. To be added to the email list for information regarding upcoming shows, email LasVegasNewsletter@BrooklynBowl.com. The first thing I see is a midget in a Ghillie suit. Oh no, it’s Natasha Wicks, in the heat, head to toe in this season’s fall fashion. She’s gearing up for a showdown with Dave Farra from Raw Vegas. It all starts well with some trash talking as they prepare for battle. Natasha taking cover in a bush, Dave bravely out in the open. Pop pop pop….paintballs are now whizzing through the air…….Dave is not a good shot….Natasha rushes forward behind a wall. Dave pops his head up one too many times and that’s all “One Shot” Wicks needs. Pow! Dave takes one to the side of the head. Natasha is now peeing herself laughing knowing she scored a direct hit. Dave emerges from behind the wall, blood streaming down his face. The fights are being held in a massive tent. Tuff-N-Nuff is an all-amateur show. Junie Browning is here looking in good health. Randy Couture is sitting ringside with special guest Dana White. Frank Mir is here cornering a couple of fighters. I’m beat, it was a long day out in the sun, with an evening of good fights. It was a good day!